Choosing the right business two-way radio is an important step in building your communication system. It is an investment that will affect the way your business operates for many years, so it is important to do research and consult a two-way radio professional before making your final decision. That way, you're sure your business will get exactly what it needs.We have outlined many key questions for you to answer to help with choosing your ideal business two-way radios. How much Range & Power do you need out of the radio? Determining the range, or distance you need your radios to transmit to, will help you determine how much power (watts) your radio needs to have. In perfect conditions, a radio can transmit up to 30 miles out...that is transmitting from a very elevated position, with NO obstacles in the line of sight, to the ground...but, for basic ground communications, once you factor in buildings, trees, and other obstacles, radio transmissions usually fade out after a couple of miles. Our Motorola two-way radio line ranges from 1-5 Watts of power. If you don’t need long distance communications, you would be fine with 1-2 Watts of power, but if you are needing radio communications to travel for a couple miles, you will need to look at the to 4-5 Watts radios. A radios power not only affects its range, it also determines the coverage and audio quality you will get in different terrain and around obstacles in the transmit path. Again, higher wattage gets you better results, but it also means quicker battery drain, so you will need to weigh these options carefully based on what is most important to your business. How many Channels will my radio need to have? This is a very important question that you need to answer at the beginning of your radio search. Determine how many talkgroups your system will need; some companies only need 2, where others may need hundreds. This will help you determine how many channels you will need. Channels are often assigned to different departments, so start by counting your departments, add in an emergency all-call channel, and maybe a Management channel for only the department heads, and you will be off to a good start. Ultimately, it all depends on how you need your communications organized for optimal productivity, efficiency and safety. We have radios that range from 8 channels to 1000, each with the ability to be programmed to fit your ideal channels and talkgroup setup, so you can get the custom solution you need. Do I need UHF or VHF? This answer depends on where you will be using your radios. VHF (Very High Frequency) radios have more spacing between signal waves, so they can transmit signals further, but they can not penetrate obstacles very well, so these radios are best suited for use in open outdoor spaces, often used in the agriculture and recreation industries. UHF (Ultra High Frequency) has much less spacing between its radio waves, which makes it great for penetrating through walls, and structures. It may not deliver the range that the VHF band can, but these radios are generally cheaper and have fewer problems with signal interference. UHF radios are great for use indoors and out, so they are ideal for the manufacturing, education, retail, hospitality, and healthcare markets. SEE ALSO: UHF V/S VHF - WHAT’S BEST FOR YOUR BUSINESS. Should I go with Digital or Analog? Analog is the proven technology behind traditional two-way radios, and most radios in production today still come with the option for Analog operations, but new Digital radios have been available for many years now, and their popularity and capabilities are only growing. If you are looking for a simple, easy radio solution, Analog may be the choice for you. Many users prefer the sound of Analog radios, saying Digital audio can sound a bit robotic, but Digital technology has opened new doors in the two-way radio world, and its advancements are only growing. Digital radios feature enhanced audio for crystal clear sound quality that reaches all the way to the outer edge of the transmission range. They can also offer double the channel capacity and longer battery life, not to mention new feature sets that are only possible through digital technology. What Size radio do you need? This is really more of a personal preference. A radio’s size has little effect on its basic functionality and more on the ruggedness of the device and the wearer’s comfort. Most people prefer a smaller radio...it’s lighter, more discreet, and less-likely to get caught on objects, but it can also be more susceptible to damage. Radios built for rugged use are typically larger as they have a thicker chassis to absorb impacts and scrapes. Our Motorola radio line comes in a variety of sizes and shapes, some built larger and more durable for heavy-use, such as on a construction site, and some radios that are light, slim and discreet, to help add to the professional atmosphere of the hospitality and retail industries. What radio Features will improve your communications? Modern two-way radios are packed with features to build up your communication system; far too many to mention, but all designed to enhance productivity, connectivity, and safety. Two of the most popular radio features are LED displays and VOX capabilities. Displays let the users get instant status updates on their battery life and channel selection. They can even allow for text messages and work-order ticket management, when using MOTOTRBO™ applications, all from the radio. VOX is another favorite feature. It allows for hands-free radio operations when used with compatible accessories; keeping users connected without the need for users to stop working just to use their radio. Do your new radios need to work with Existing communication devices? Digital technology not only enhances audio, system capacity and battery life, it gives users the ability to connect their radio systems to their other communication systems. Having the ability to connect your two-way radios with cellular or landline telephones, connects your workforce like never before; letting cross-department communication occur without the need for multiple devices. If you already have a radio fleet and you are just looking to add a few new models or to start the transition to digital, be sure to find a radio that will be able to communicate with your existing fleet. This will help make for a smooth integration and keep your communications at peak performance. Also, if you are currently using or intend on using a repeater to increase range and capacity, make sure you pick a radio that can handle repeater function. Some of our entry-tier radios are not compatible with repeater technology. If you are unsure, give us a call at 1-800-396-1911 and our representatives will gladly help you find the best two-way radio for your business. What level of Dust and Water protection do you need? How long does your Battery need to last? Almost all of our radio models have multiple choices when it comes to the battery chemistry and life, but you need to make sure you can get the power you need before making the purchase. Our lower tier radio batteries last for around 8-12 hours, where our high-tier radios can last up to 29 hours! Some of our radio models also have compatible Alkaline battery trays to allow the radio to run on AA or AAA batteries as an emergency backup supply. We offer a full range of Motorola accessories, just CLICK HERE, and choose your radio model to see its compatible batteries. 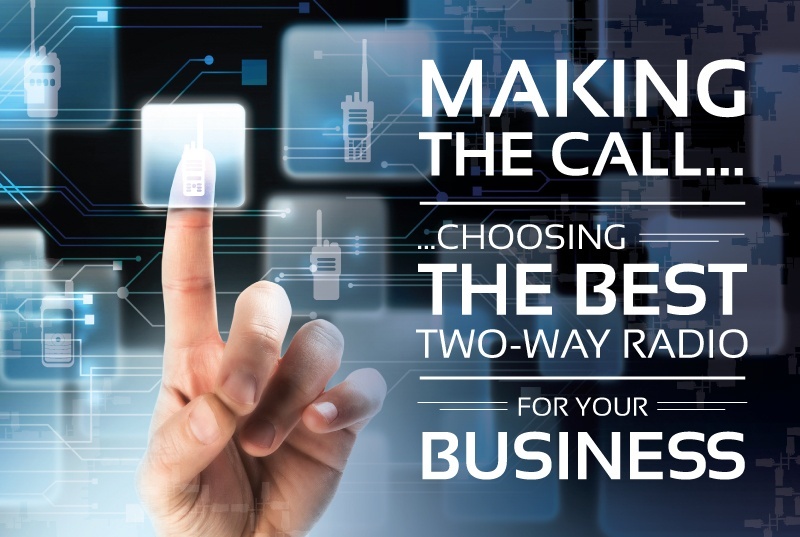 With these questions answered, you now have the information needed to choose your next business two-way radio. If you’re ready for the next step, click the link below and check out our selection of Motorola radios and pick the model that’s right for you! If you would like help from one of our radio professionals, just give us a call at 1-800-396-1911, and speak to a live representative! We are a veteran, family owned business specializing in wireless solutions for your business. 1-800-396-1911 to speak to a representative today so that Amerizon may help you with your two-way radio communication needs. © 2014 Amerizon Wireless. All Rights Reserved.